and I thought, “That one! That is a cute one! I want THAT ONE!” I clicked on the link and found out it was a gDiaper. I don’t like the look of snaps, the velcro seemed like a much cleaner look to me. I thought snaps might be more difficult during the late night diaper changes, trying to remember which snap I am supposed to use, and try explaining all the snaps to babysitters or family members! To me, velcro is simple and easy. I wanted a cute diaper, and having snaps all up and down the diaper kind of defeated that purpose for me. 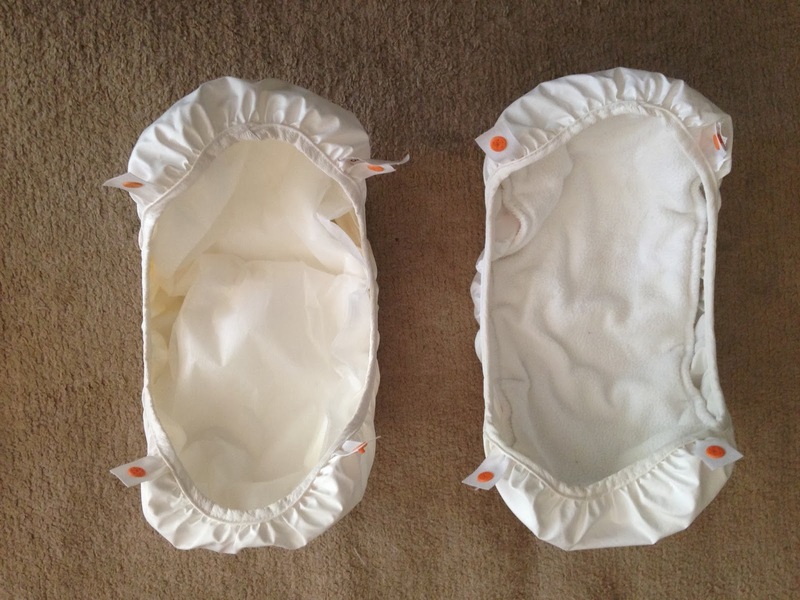 gDiapers has a disposable insert option that is eco friendly. You can compost the disposable inserts, flush them down the toilet, or dispose of them in an eco friendly garbage bag. You put the insert in the pouch, the pouch snaps into the gPant, and the gPant goes on the baby. Viola! When the diaper is dirty, you simple change the insert! If the insert is just wet, all that needs to be replaced is the insert. If there is poo, sometimes the pouch needs to be changed as well, but most of the time the pouch is still clean. The insert will bunch up a bit, and poo might get on the pouch when that happens. But it’s no big deal, you simple unsnap the pouch and snap in a new one, then add your insert. (That is the less laundry part. You don’t have to change the entire diaper at every diaper change!) We have been using gDiapers for over a year now, and we have had to change the gPant due to poo or pee getting on it maybe 10 times. Some of those times were my fault, I didn’t get the diaper completely over her bum, babies sure can wiggle a lot! We have had poo-plosions or poo-magedons, but very rarely have we had to change the gPant. We have NEVER had to change her outfit due to poo escaping it confines AKA the diaper. Once or twice the poo has escaped and gotten on the very edge of the gPant, but it has never touched her clothes! Some of our pee leakage has been from Bunny being a stomach sleeper. Sleeping on her stomach breaks the seal of the diaper, which causes it to leak. We use 1 gPant per day. (Well, technically two because I like to give her a new gPant after her bath. I don’t put on the same underwear after I bathe, I figure a nice clean gPant feel good on her cute little bum.) I coordinate her diaper to her outfit, or sometimes her outfit to her diaper! gPants come in many different colors and patterns. I literally have a gPant for every outfit Bunny owns. It drives My Love crazy sometimes. But cloth diapers are gross, right? WRONG! Bunny was Exclusively Breast Fed until she was 6 months old. That means her poo was water soluble. I could toss her dirty diapers into the diaper pail and wash them without doing anything to them! Now that she is eating solid food, its a little more complicated. She doesn’t have poo-magedons anymore, which makes it a little easier to clean. I simply dump the poo in the toilet, or grab it off the insert with a wipe. (That part is a little yucky, I keep telling My Love I need a diaper sprayer!) 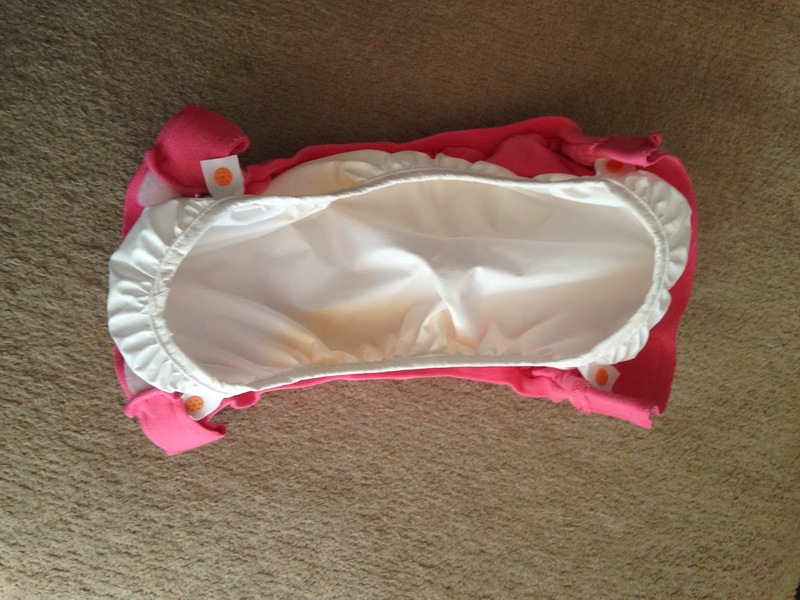 Then I toss the soiled parts, normally just the cloth insert, into the diaper pail. We use cloth inserts when we are home, and I use them when we are out and about. My Love likes to use the disposable inserts when we are out of the house. The disposable inserts are nice to have, especially for traveling. We have taken a few trips with Bunny, and have used the disposable inserts while on vacation. We also use a disposable insert at night, because Bunny is still a stomach sleeper and while the gCloth isn’t so good at holding her pee while she sleeps on her stomach. The gDiapers disposable inserts are great for night time! We have also used the disposable inserts when Bunny had a bad diaper rash which required ointment that was bad for the cloth inserts. (Some diaper rash creams and ointments, as well as medication, can stain your cloth inserts or cause build up which makes them not as absorbent.) It is nice to have the disposable option, it makes cloth diapering on vacation still a viable option. 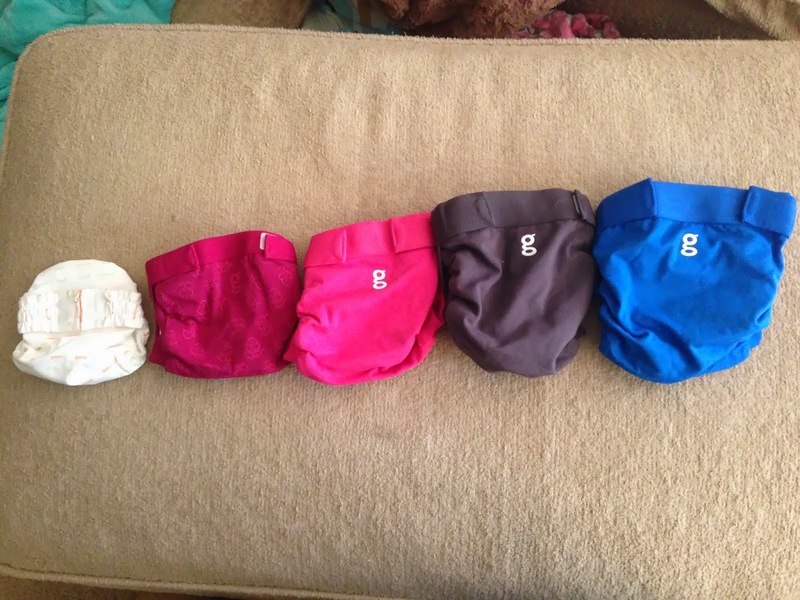 gDiapers come in 5 sizes. Newborn fits babies 6-10 pounds. We started with the newborn size. We tried them in the hospital and they were not fitting right due to Bunny’s cord, so we used the disposable diapers the hospital gave us until her cord fell off. (BAD eco friendly parents!) She was in these from 8 days old until about 8 weeks old. She was 7 pounds when she was born. Small fits babies 8-14 pounds. Some people skip the newborn size and go straight to smalls. Bunny moved into these when she was 8 weeks old and wore them until about 4 months old. Medium fits babies 13-28 pounds. Bunny has been in mediums since about 4 months and is still in mediums at a year (18 pounds). Mediums by far get the most use out of them. Large fits babies 22-36 pounds. Extra Large fits babies 34+ pounds. I doubt we will ever get there with Bunny. The downside to using gDiapers is you have to buy multiple sizes. gDiapers releases new colors and prints twice a year. Because of this I have WAY too many gDiapers. However, you can get away with only having 6-8 gPants because you do not change the gPant at every diaper change. If you are doing laundry every 2-3 days I would suggest having 8 gPants, 24 or more pouches, and 40 or more cloth inserts. 40 cloth inserts allows you to change the diaper every 2 hours round the clock and still have some clean inserts while your dirty ones are in the washing machine. With cloth diapers, it is recommended you change the diaper every 1-2 hours vs. disposables where you can get away with changing every 2-3 hours. As for the ease of use, multiple family members have changed Bunny’s diaper and they all comment on how simple and easy it was, less complicated and scary than they had thought it would be! I love my gDiapers. I have (almost) used them since the day Bunny was born, and I will use them until she potty trains. I will use them with the next baby, and the next one, and the one after that. Then I will sell them! They hold their resell value REALLY well! (some people pay $100 for a hard to find, discontinued, out of print used gdiaper! Craziness!) 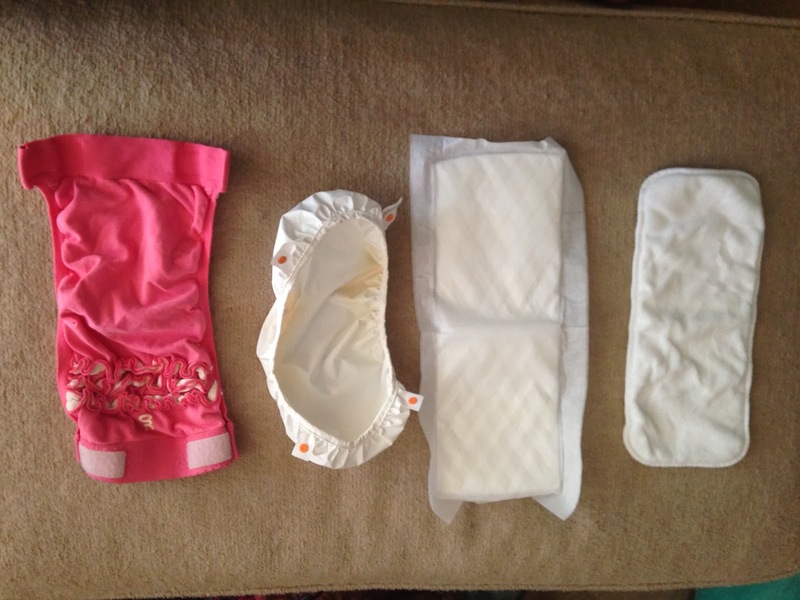 gDiapers are cute, easy, eco friendly, and my #1 choice. Because this post wasn’t already long enough, here are a few reasons why cloth diapers are a better choice, in my opinion, than disposable diapers. Cloth diapers are eco friendly, better for the environment. Disposable diapers go in a land fill, and take up to 550 years to decompose! 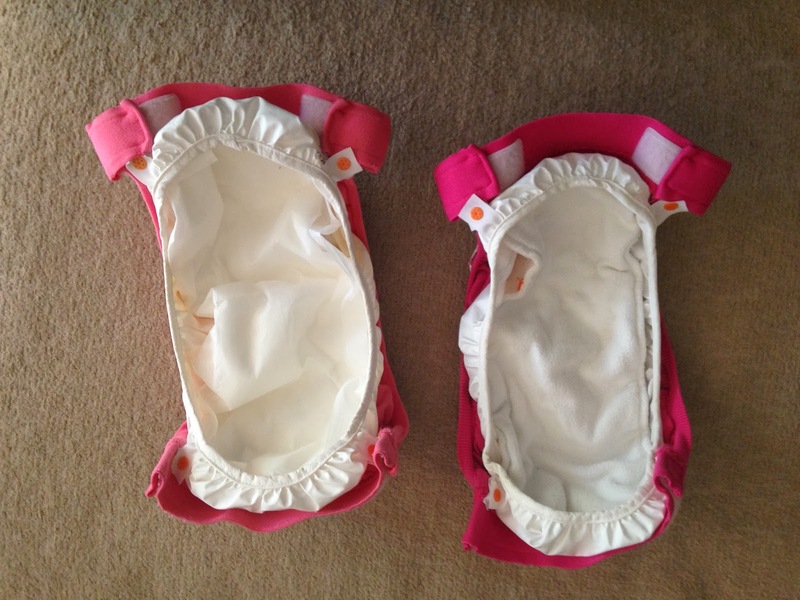 The diapers you and I used as a baby (my parents did use cloth diapers for some of my diapering years, they switched to disposables in part because others would ask them things like, “why are you using cloth on your child? Do you not love her?? ?”) An average child will go through 4-8 thousand diapers in their life, newborn to potty training age. That’s an estimated 27 billion disposable diapers each year just in the USA!!! Cloth diapers are less expensive than disposable diapers. Remember how each child will use 4-8 thousand diapers in their life? That is an estimated 2-3 THOUSAND dollars! PER CHILD! You can buy an entire cloth diaper set up for around $400 if you are buying new. If you buy used, you can cut that cost in half. You can also use those same diapers for multiple children. And you can sell them when you are done! There are no nasty chemicals in cloth diapers. Disposables contain Sodium Polyacrylate, which is the super absorbent gelling material that allows you to go hours and hours between diaper changed. Sodium Polyacrylate has been linked to toxic shock syndrome, allergic reactions, and it is potentially lethal to pets. Most disposables also have Dioxin in them, which the U.S. Environmental Protection Agency has classified as a probable human carcinogen. Babies who wear cloth diapers do not have as many diaper rashes as babies in disposables. This is because cloth diapers are more absorbent and wick the moisture away quickly, wear as disposable diapers hold the moisture in the super absorbent gel material, but it stays right next to baby’s bum. I have never had a blow out. Enough said. They are OH SO CUTE!!!!! Who needs diaper covers or bloomers when you have cloth diapers?! Not me! The diaper cover that comes with every dress, I give them away to friends who use disposables. I am sure there are more reasons, but these are my top 6. I love cloth diapers, and I love using gDiapers. Even My Love likes them!